Retractable ballpoint pen delivers neat, accurate lines with smooth-flowing ink. Design features a soft rubber grip for comfort and extra-wide clip that attaches to books, binders, legal pads and more. Clear barrel displays ink supply. 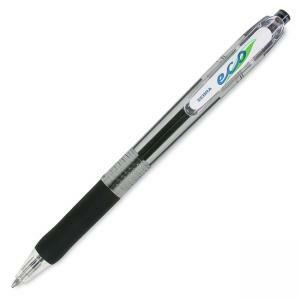 Ballpoint pen is made with more than 75 percent post-consumer material. Refillable with Zebra's LH-Refill.